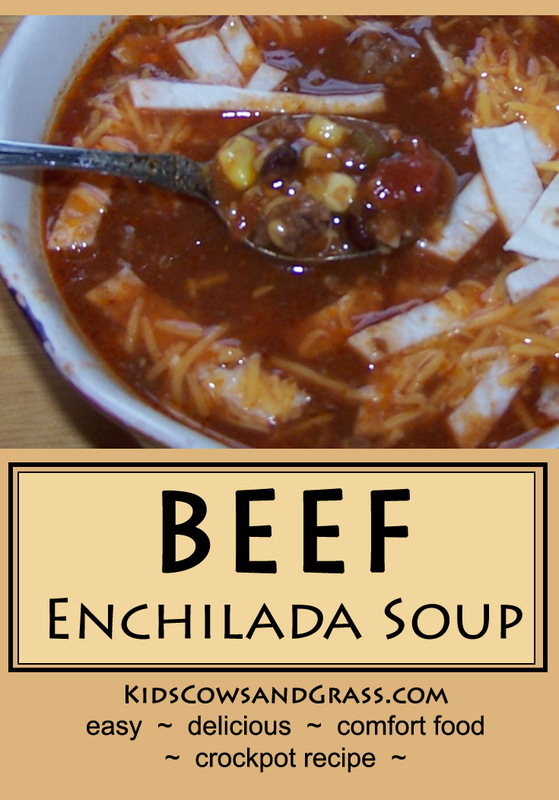 Kids, Cows and Grass: Beef Enchilada Soup will warm you up! 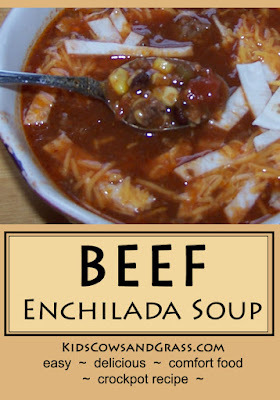 Beef Enchilada Soup will warm you up! Some days you just need a bit of comfort food--something warm, filling and cheesy! That is my definition of "comfort food!" Add in easy and quick to make and we have a winner! Today is one of those days--a comfort food kind of day. It is drizzly and cold in Kansas and a crockpot full of Beef Enchilada Soup from my homemade recipe sounds great. And even better...it smells amazing when you come back into the house from being outside! My daughter and I must think alike -- while I was making a large crockpot full of Enchilada Soup this morning, she was deciding to come home for lunch from school. We are very lucky, our small town school has a cook who makes mostly homemade lunches for the kids. My boys actually ask what is for lunch instead of what classes they have! But when she walked in the front door, she smelled the soup and said that is exactly what she was wanting today! I think I'll make a loaf of whole wheat bread or possibly some biscuits to go with it. One of the best things about this soup is that each person tops it with what they like: shredded cheese, sliced avocados, sliced flour tortillas, sour cream, fresh cilantro, or a touch more chili powder. However you top it, Enchilada Soup is an easy, delicious, healthy comfort food! So go dig out your crockpot and get it ready for a big pot of deliciousness today! Put ingredients into crockpot on low for the day, or on high for a couple of hours. It can also be cooked on the stovetop. The key is to heat through and allow flavors to meld....it will also make your house smell wonderful and drive the family nuts! Top with sliced flour tortillas--this is important! They act like noodles and are delicious. Also offer shredded cheese, avocado, cilantro, sour cream, additional seasoning,...anything that sounds good! Enjoy! If the quantity is just tooooo much for your family, I have made a half quantity in the crockpot and frozen the rest for another day. 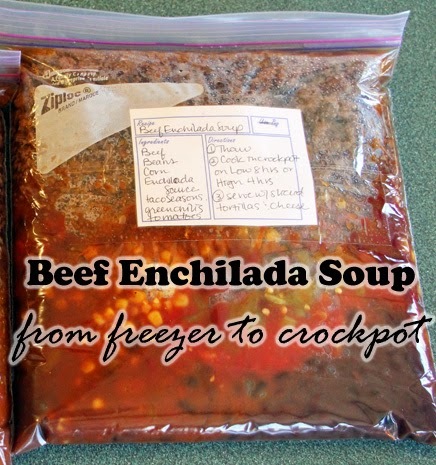 Check out Freezer to Crockpot Beef Enchilada Soup. So what is your favorite comfort food? And what kind of days cause you to crave your comfort food? Off to get the recipes for this! So happy that you posted. I also see chicken recipes, but I like beef so much better. That soup would be a big big hit at home. I am so going to make that for my family. It really looks great. This sounds really good, thank you for posting. Once it cools down around here I'm giving it a try! I am totally making this for tomorrow!! I love soups!! How did your family like the soup, Johnna? I haven't made it since the kids left for college, but I have it in my crockpot rotation for winter!